Unknown; instruments are similar to ones from Korea and China. 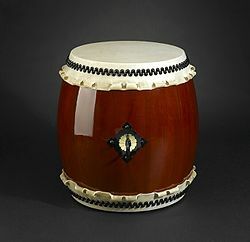 Specific drums are similar to ones from India and other cultures. Likely introduced to Japan by Korean and Chinese cultural influence between 300–900 CE. Barakan, P. "Discussion: A Woman Playing Japanese Drums". In Wadaiko, 124-135: Kawade Shobō Shinsha, 1995. Bender, Shawn. "Of Roots and Race: Discourses of Body and Place in Japanese Taiko Drumming". Social Science Japan 8, no. 2 (2005): 197-212. Chatenever, R. "A Different Drummer". Maui Scene (1993). Fujie, Linda. "Effects of Urbanization on Matsuri-Bayashi in Tokyo". Yearbook for Traditional Music, 15, no. East Asian Musics (1983): 38-44. Fromartz, Samuel, and Lauren Greenfield. "Anything but Quiet: Japanese Americans Reinvent Taiko Drumming". Natural History 107, no. 2 (1998): 44-50. Kagemusha, Taiko. "Taiko around the World". 2004. Kobayashi, Tamai. "Heartbeat in the Diaspora: Taiko and Community". Fuse 12, no. 5/6 (1994): 24-26. Konagaya, Hideyo. "Taiko as Performance: Creating Japanese American Traditions". The Japanese Journal of American Studies 12 (2001): 105-123. Morechard, Francoise. "Emotions That Japanese Have Forgotten". In Wadaiko: Miyuki Ikeda + Koichi Inakoshi, ed. Ikanoshi Koichi. Tokyo: Kawada Shobo Shinsha, 1995. Nakamura, Hajime, and Hajime Nakamura. Ways of Thinking of Eastern Peoples: India, China, Tibet, Japan. London; New York New York: Kegan Paul International; Distributed by Columbia University Press, 1997. Navarro, Mireya. "Young Japanese Americans Honor Ethnic Roots". New York Times National, 2004, 15. Pelzel, John C. "Japanese Ethnological and Sociological Research". American Anthropologist 50, no. 1 (1948): 54-72. Terada, Yoshitaka. "Shifting Identities in Taiko Music". In Transcending Boundaries: Asian Musics in North America, ed. Yoshitaka Terada, 22, 37-59. Osaka: National Museum of Ethnology, 2001. "The Cultural Properties Protection Law and Japan’s Folk Performing Arts". Asian Folklore Studies 53, no. 2 (1994): 211-225. Uyechi, Linda. "University Taiko: Roots and Evolution". In Symposium on North American Taiko, Stanford Taiko Invitational. Stanford, CA. Yano, Christine R. "The Reintegration of Japanese Bon Dance in Hawaii after World War II". Selected Reports in Ethnomusicology 6, Asian Music in North America (1985): 151-162. "Hokubei No Taiko Sangyou". [The Taiko Industry in America]. Taikology, no. 14 (1998): 58-61. Gould, Michael. "Taiko Classification and Manufacturing". Percussive Notes (1998): 12-20. Kodani, M. "Making a Taiko". Horaku (1979). Mallin, Lorne. "Wood and Skin: The Making of Taiko Drums". Intersect (1993): 26-29. Thompson, Woody. "Two Custom Drum Makers: William Kooienga and Paul Namkung". Percussive Notes, PAS (1998): 6-10. Combs, Jo Anne. "Japanese-American Music and Dance in Los Angeles, 1930-1942". Selected Reports in Ethnomusicology 6, no. Asian Music in North America (1985): 121-149. Hobsbawm, E. J., and T. O. Ranger. The Invention of Tradition. Cambridge [Cambridgeshire]; New York: Cambridge University Press, 1983. Hiroji, Naoe. "Post-War Folklore Research Work in Japan". Folklore Studies 8 (1949): 277-284. McCullough, Helen Craig (ed.). The Taiheiki: A Chronicle of Medieval Japan. New York: Columbia University Press, 1959. Morinaga, Maki Isaka. Secrecy in Japanese Arts: "Secret Transmission" as a Mode of Knowledge. 1st ed. New York: Palgrave Macmillan, 2005. "Nihon No Taiko No Bunrui Kaisetsu". [A Cultural Analysis of Japanese Drums]. Minzoku Geino, no. 11 (1990). Ong, E. "An Ancient Big Bang Theory". The Stanford Daily: Intermission (1994). Thornbury, Barbara E. "From Festival Setting to Center Stage: Preserving Japan’s Folk Performing Arts". Asian Theatre Journal 10, no. 2 (1993): 163-178. Tradition and Modernization in Japanese Culture. Princeton, N.J.: Princeton University Press, 1971. Bender, Shawn. "Drumming from Screen to Stage: Ondekoza's Ōdaiko and the Reimagining of Japanese Taiko". The Journal of Asian Studies (2010), 69: 843-867. Chun, Ian. "Gocoo: Reinventing Taiko". Metropolis, May 17, 2006. Accessed July 9, 2006. Image Entertainment (Firm), and Kodō (Musical group). Kodō. 1 videodisc (69 min.). Chatsworth, CA: Image Entertainment, 2001. O'Mahoney, Terry. "Kodo: Japanese Taiko Masters". Percussive Notes: PAS 36, no. 1 (1998): 6-10. Oguchi, Daihachi. "Tenko: Osuwa Taiko". (1980). Thalheimer, Andrew. "Jazzing up Tradition". In Japan Notes: Japan America Society of St. Louis, 8, 2-4, 2003. Ulrich, A. "Pounding Ecstasy". San Francisco Focus (1993): 67-68. Bando, Makoto. Hajimete No Wadaiko Ensō [First Japanese Taiko Performance]. Tokyo: Erukurabu, 2003. Mogi, Hitoshi. Nyūmon Nihon No Taiko: Minzoku Dentō Soshite Nyūwēbu A Manual of Japanese Drums: Folklore, Tradition, and the New Wave. Tokyo: Heibonsha, 2003. Powell, Kimberly. "The Apprenticeship of Embodied Knowledge in a Taiko Drumming Ensemble". In Knowing Bodies, Moving Minds, ed. Liora Bresler, 183-195. Boston: Kluwer Academic Publishers, 2004. Takata, Takeshi. “The Thundering World of the Taiko”. Taikology Magazine, 1998. Sano, Steve, and Linda Uyechi. "Music 17q Perspectives in North American Taiko Course Syllabus". University of California Stanford, 2004. Schnell, Scott. The Rousing Drum: Ritual Practice in a Japanese Community. Honolulu: University of Hawaii Press, 1999. Wadaiko Ga Wakaru Hon. [Understanding Taiko], ed. Asano Taiko Co.: Asano Taiko, 1995. Wadaiko Nyūmon. [Introduction to Taiko], ed. Taiko Center. Kyoto: Taiko Center, 1992. "What Is Taiko". The Kodō Beat, Winter 2001, 1-2. Green, M. "Voices of the Drum". Sky (1993): 32-36. "Japanese Taiko Drumming in International Performance: Converging Musiocal Ideas in the Search for Success on Stage". World of Music 43, no. 2-3 (2001): 93-101. James, J. Alison. The Drums of Noto Hanto. DK Publishing, Inc, 1999. "Japanese American National Museum to Open Exhibition". July 14. Big Drum: Taiko in the United States, May 17. Accessed May 17, 2006. Holvick, Leonard C., and Jackson H. Bailey. Japanese Music: Another Tradition, Other Sounds: Earlham College Press, January 1990. Markus, Peter. Taiko Do: Der Trommelweg (the Way of the Taiko). [Taiko Do: The Way of the Drum]. Ergerda: Arun, 1996. McNicol, Tony. "Drum Songs: The Intoxicating Music of Hachijojima". Wingspan (January 2006) : 31-35. Music Cultures of the Pacific, the near East, and Asia: Prentice-Hall, Inc., 1977. Six Hidden Views of Japanese Music. Berkeley: University of California Press, 1986. Traditional Japanese Music and Musical Instruments. 354 p. Tokyo; New York: Kodansha International, 2000. Yamamoto, Hiroko. "Nihon No Taiko, Ajia No Taiko" [Japanese Drums, Asian Drums]. Tokyo: Seikyusha, 2002. Yamazaki, Kiyonori. "Wadaiko Ongaku Ni Mieru Nihon No Rizumu: Ma, Omote Ma, Ura Ma" [Japan’s Rhythm as Seen in Japanese Taiko Music: Space, Fore-Space, Back-Space]. Tokyo: Nihon Zusho Kankoukai, 2003. Kageyama, Y. "Following the Drumbeat". The Japan Times Weekly (1986): 16. Inoue, T. "Taiko Time". MetroGuide (1994): 33-34. Di Menna, Jodi. "Martial artistry". Canadian Geographic, January 2006, Vol. 126 Issue 1, p. 92-93, 2p, 1c; (AN 19475626). Martin, Douglas. 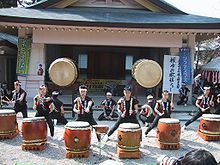 "Banging the Drums Not So Slowly: In Soh Daiko, Japanese Drumming Calls to the Ancient Gods and Leaves the Drummers Breathless". New York Times, 22 October 1995 1995. Endo, Kenny. "Kenny Endo Taiko Ensemble". 18-23: University of Maryland: Clarice Smith Performing Arts Center, 2005-2006. Portrait of Hayashi Eitetsu. Tokyo: Eitetsu Taiko no Kai, 1998. Hayashi, Eitetsu. Ashita No Taiko Uchi E [To Tomorrow's Taiko Players]. Japan: Shobunsha, 1992. Higa, K. "Sound and Spirit: An Interview with Master Seiichi Tanaka". Nikkei Taiko Dayori (193): 6-7, 10-12. Schulze, M. "Taiko Group Founder Enjoying Country Life". Hokubei mainichi, 27 July 1991. Fujimoto, Harumi. "My Original Image of Drums". In Wadaiko: Miyuki Ikeda + Koichi Inakoshi, ed. Ikanoshi Koichi. Tokyo: Kawad Shobo Shinsha, 1995. "An Introduction to Taiko Drum Music in the Japanese No Drama". Ethnomusicology 4, no. 2 (1960): 75-78. Shively, Donald H. "Bakufu Versus Kabuki Studies in the Institutional History of Early Modern Japan," in Studies in the Institutional History of Early Modern Japan (John Whitney Hall and Marius Jansen, eds. ), x, 396. Princeton, N.J.: Princeton University Press, 1968. Hare, Thomas Blenman. "Try Try Again: Training in Noh Drama". In Teaching and Learning in Japan, ed. Thomas P. Rohlen and Gerald K. LeTendre. New York: Cambridge University Press, 1998. Doyle, M. "The Beat Goes On". MidWeek (1996): A6-A9. Hayase, S. "Taiko". East Wind (1985): 46-47. Lockett, Peter. "Eastern Invasion". Rhythm Magazine (1997): 70-72. Muromoto, W. "Thunder in Wahiawa". The Hawaii Herald, 21 February 1986, 10-11. Nagauta. Greenwood Publishing Group, 1973. Nihon No Taiko. Nagano: Osuwa Gakuen, 1994. Okihiro, G. " 'Drumatic' Excitement". Silhouette (1988): 7-8. Taiko No Bīto Ni Miserarete [Enchanted by the Taiko Beat]. Tokyo: Ongaku Shuppansha, 1999. "Taiko". In Nihon Kokugo Daijiten. Tokyo: Sōgakukan, 2001. Santoki, M. "The Ambassador of Taiko". The Hawaii Herald, 16 February 1996, A5-A6. Suravech, Glen. "Bang the Drum!" Rafu Shimpo, 26 March 1992. Takemoto, Arthur. Buddhist Taiko. Hou-u: Dharma Rain, July 8, 2004. Accessed May 9, 2006.